Joyce Glasser reviews Starred Up (March 21, 2014) Cert. 18, 105 min. After the disappointing Stallone/Schwarzenegger prison thriller, Escape Plan, even the most avid fans of the prison genre might have been put off from returning to the cinema any time soon. 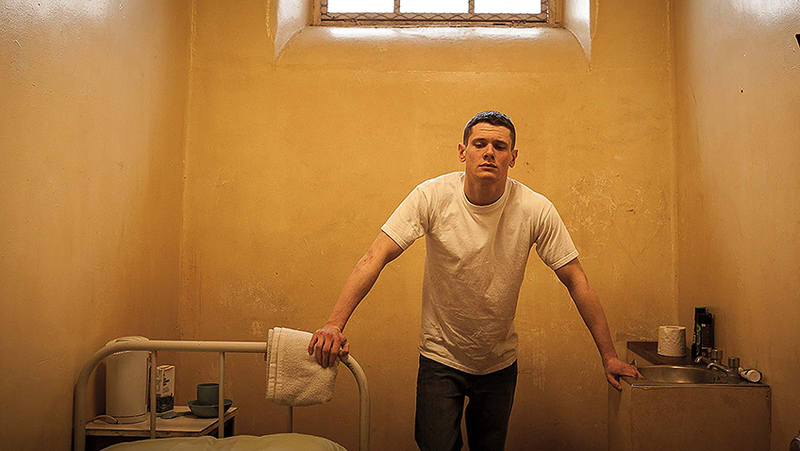 And then along comes David Mackenzie’s (Young Adam, Hallam Foe) Starred Up , which, after A Prophet, is arguably the best prison film in recent memory. In addition to a superb lead performance from Jack O’Connell (Harry Brown, Eden Lake, This is England), what makes Starred Up worth the familiar setting and rattling of keys is the authentic and nuanced script by first-time scriptwriter Jonathan Asser. Asser worked as a prison therapist for twelve years and his experience informs the key character of Oliver (Rupert Friend, TV’s Homeland, Joe Wright’s Pride and Prejudice), a volunteer therapist who believes prison must provide an opportunity for rehabilitation or the cycle of violence will never be broken. Eric (O’Connell) is a handsome, hyper, young man who has gone through the care system and has just been ‘starred up.’ That’s prison argot (there is a lot of it in the film) for prematurely moved from a young offenders’ institute to an adult prison. He immediately establishes himself as the equal in strength and volatility to any of the adult inmates. Punishment only fuels his rage. If this lack of self-control is flagged up by Deputy Governor Hayes (Sam Spruell) as a threat to his record for a smoothly run prison, Oliver spots an all-too familiar condition that can be treated. 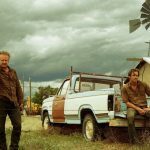 Eric’s display is also noted with a surprising, protective instinct by Nev (Ben Mendelsohn, Animal Kingdom, The Place Beyond the Pines), a fellow inmate and the father Eric has not seen since he was six. When Eric reluctantly agrees to therapy, he befriends two black inmates, Hassan (Anthony Welsh, Brother the Devil) and Tyrone (David Ajala, The Dark Knight, Fast and Furious). They invite Eric to their room for tea and work out in the gym with him. Nev, a control freak living in a secret homosexual relationship with another inmate, tries to break up his son’s relationship with these men and even becomes jealous of Eric’s relationship with Oliver. You cannot but feel for Eric, who, for every step he progresses, is dragged back two. If Nev is inadvertently a threat to his son’ s progress, more tension arises when Deputy Hayes pulls Eric out of the therapy and terminates Oliver’s employment. When prison politics and personal grudges pose a threat to his son’s life, Nev does his best to become the father Eric never had. O’Connell, 23, has been acting since 2006 in a variety of roles, from bad guy to the lead in the mawkish WWI drama Private Peaceful. His performance as a gang leader in the excellent 2008 British thriller/horror film, Eden Lake was impressive, but Starred Up is his break-through film. O’Connell’s tough side is raw and spontaneous and all the more effective for being mixed with vulnerability and boyish good looks (he’s 24). While the characters are, for the most part, well drawn, Deputy Hayes comes across as a variation on the stereotypical heartless prison warden, intent on seeking revenge on Eric in order to assert his power. We can just about imagine, however, that Hayes began the job as idealistic manager, and, over the years has become disillusioned with too many bad seeds who have not been worth the benefit of the doubt. A bit more nuance would have gone a long way. Also problematic is the sentimentalism at the end and some overacting on Mendelsohn’s side. As anyone who saw Mendelsohn’s performance in Animal Kingdom can attest, the man can act, and it’s generally evident here; but why do casting agents and directors insist on pairing, as father and son, two men who couldn’t possibly share a physical gene? If Starred Up were merely a prison drama it might not be worth bringing up, but it is a relationship movie as well, and despite the good acting, it is hard to imagine these two are related.